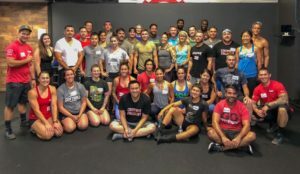 Just wanna say thank you to CrossFit HQ for approving our gym to host a Level 1 Seminar over the weekend. We had 7 (Kaley, Christie, Vicky, E-rick, Rodney, Jaspal and John K) members attend and they found out today that they all passed! We now have 7 more trainers working out on the floor with us daily. Congrats guys and thank you all for taking the course and helping CFoF Family continue to get better.